In my last post I discussed white walls, but today’s topic is a little more outside the box. Why paint just your walls when you’ve got prime surface area above your head and below your feet? Painted ceilings and painted floors are wonderful. A whimsical rarity, this is a DIY project you should definitely consider. The glorious thing about painting these surfaces is that you can really go any way you want: classic, modern, playful, charming, artful, elegant, but in all cases flat out awesome. It is a terrific way to add a completely unique statement to any room. A painted ceiling works really well with neutral walls. It’s subtle yet simultaneously bold and can highlight items and furniture of the same or opposing colors. Draw inspiration from cathedral ceilings or tapestries for a more intricate design. 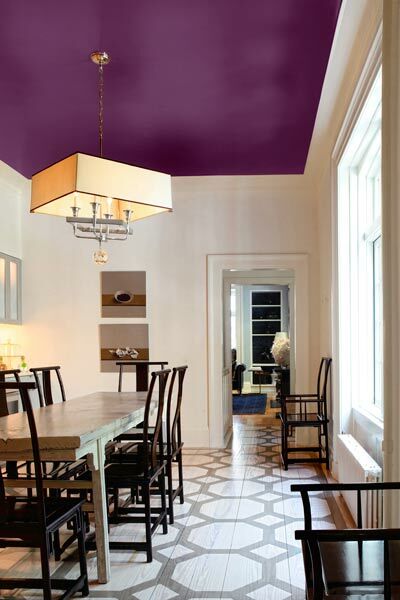 You could also paint your ceiling the same color as your walls for continuity, or a different color for diversity. This is a particularly fun idea for a child’s room. There are tons of options, and even more so if you’ve got trim or wallpaper! There is something just absolutely delightful about a painted hardwood floor. A large-squared checkerboard floor is classy and fun, and is easily one of the most popular designs. But choosing a solid color is also a good move. Concrete and tile are just as paintable. Consider checkerboard, solid, or stenciling intricate patterns for any surface. Perhaps it’s the novelty or the considerably vintage-y look, but painted floors evoke a nostalgic and dreamy feeling and it is sensational. And although you’ve now got whole new levels of bold in your home, the ceilings and floors will not out-compete your window treatments, furniture, or other decorations. Au contraire! The way you design the rest of the room will only push the overall energy further. Match or counter your curtains to the ceiling, compliment your light green floor with a robin’s egg end table, incorporate your painted patterns in pillows, vases, or wall art. Dare to go even further by painting both the ceiling and the floor! The only limit is how far you want to take it! I’ve only scratched the surface about how nice, how diverse, and how fantastic painted ceilings and painted floors are. Treat yourself and Google Image “painted floors” and “painted ceilings” and get inspired!